Former speaker of the house John Boehner has emerged as one of the most vocal advocates in the GOP for legalizing marijuana. Above, Boehner answers questions at the U.S. Capitol on December 5, 2013. John Boehner has been known to enjoy the occasional adult beverage. He famously nicknamed his negotiations over raising the nation's debt ceiling in 2011 the "Nicorettes and Merlot sessions." Nicorette because that's what President Obama would chew during the talks. Merlot because that was the drink of choice for the former speaker of the House. These days, the Ohio Republican has expanded his view of what should and should not count as a socially acceptable vice. He's no longer just a wine enthusiast. Rather, he's emerged as one of the most vocal advocates in the GOP for marijuana legalization. To be sure, Boehner says he has never tried marijuana. "I've never used the product. I really have no plans to use the product," he told host Michel Martin in an interview for NPR's All Things Considered. "But if other people use the product," Boehner said, "who am I to say they shouldn't?" His embrace of marijuana legalization marks a sharp reversal for Boehner since his time in Congress. In 1999, in his one and only vote on the issue, he voted to prohibit medicinal marijuana in Washington, D.C. In 2011, he wrote a constituent to say he was "unalterably opposed to the legalization of marijuana." But since his retirement in 2015, Boehner's position has evolved. Last April, he joined the board of Acreage Holdings, a publicly-traded cannabis company based in New York. And on Friday, he appeared at the South by Southwest festival for a keynote on legalization. "I feel like I'm like your average American who over the years began to look at this a little differently and I think over the last five years my position, it has kind of softened up and softened up," Boehner said. Part of this shift, he said, has been driven by conversations with veterans who have turned to marijuana to ease their suffering from chronic pain or post-traumatic stress disorder. However, due to federal prohibitions, efforts to study the drug as a possible alternative to opioids and anti-depressants have been hampered at the Department of Veterans Affairs. "I started to reach out to some of my friends, neighbors and others," Boehner said. "And I thought, 'You know, there's more interest in this than I would have guessed.' "
Despite his about-face, Boehner said he had no regrets about his past position on the issue — in particular, what it meant for the criminal justice system. As Quartz reported last year, more than 400,000 people were arrested for marijuana sales or trafficking during his time as time as speaker from 2011 to 2015. "I don't have any regrets at all," Boehner said. "I was opposed to the use of it. The whole criminal justice part of this, frankly, it never crossed my mind." Boehner's reversal has mirrored a wider shift in the nation at-large. Today, 34 states and the District of Columbia have approved the use of marijuana for either medical or recreational purposes, according to the National Conference of State Legislatures. In October, a Pew Research Center survey found that 62 percent of Americans said the use of marijuana should be legalized. When Pew asked the same question in 2010, just 41 percent of Americans were in favor. Within Boehner's own party, support is more tepid. In the Pew survey, just 45 percent of Republicans felt marijuana should be legal. Asked about attitudes within the GOP, Boehner said, "States have spoken up, and I think even Republicans in Congress would recognize it's time for Washington to get out of the way." Boehner said that a proposal introduced in the Senate by Elizabeth Warren, D-Mass., and Cory Gardner, R-Colo., "would solve a lot of problems for companies trying to operate" in states where marijuana is now legal. The measure, known as the STATES Act, would protect marijuana users and businesses in these states from federal interference. He said the Food and Drug Administration should also reconsider its classification of marijuana as a Schedule I drug. The classification, which puts marijuana in the same category as heroin and LSD, has stymied efforts to study the potential health benefits of the drug. Boehner said he's not fazed by this relative lack of research, or by concerns that legalization would make it easier for heavy users to abuse the drug. "It can be used to excess, and likely will," he said. "But that doesn't mean that we should take wine or liquor off the market, or beer or cigarettes for that matter. And I do think that by decriminalizing, you're going to open up a lot more research so we can learn more about the 4,000 year history of the use of this plant." This weekend, the annual South by Southwest festival is wrapping up in Austin, Texas. Now, South by Southwest is known for its tech, film and music scene, but more political and policy types are making their way to the Texas capital. This year, the Republican former speaker of the House and Ohio Congressman John Boehner gave a keynote speech. It was not about bipartisanship or civility or some of the other things that former statesmen usually talk about. It was about cannabis. 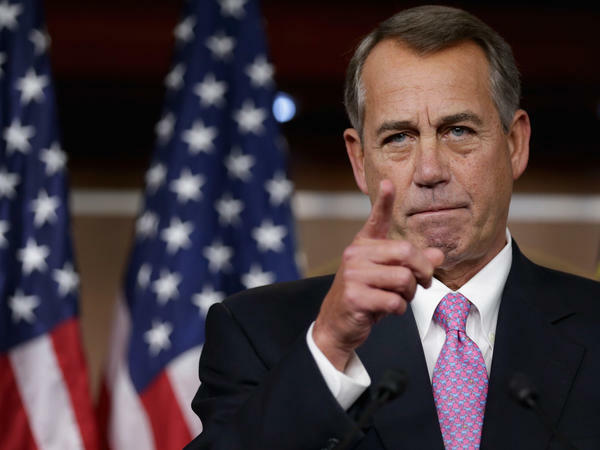 Last year, John Boehner joined the board of directors for Acreage Holdings. That's a company that cultivates, processes and dispenses cannabis. And former Speaker Boehner's with us now from Austin, Texas. Mr. Speaker, thank you so much for talking to us. JOHN BOEHNER: I'm glad to be with you. MARTIN: You know, I think people might be surprised. Your one and only vote on this issue came in 1999 when you voted to prohibit medical marijuana in Washington. In 2011, you're quoted as saying you were "unalterably opposed to legalization." So what changed your mind? BOEHNER: Well, I feel like I'm like your average American who, over the years, began to look at this a little differently. And I think, over the last five years, my position just kind of softened up and softened up. And then, I began to chat with people, you know, parents with children who have seizures who found relief with CBD and talked to some veterans who had some PTSD issues, some ongoing chronic pain issues. So I began to move. And then Acreage people came to talk to me, and I really wasn't going to do this. But I decided, well, I'm going to do some more research. And so I started to reach out to some of my friends, neighbors and others, and I thought, you know, there's more interest in this than I would've guessed. And 33 states have passed the use of cannabis in some form in their states. And, you know, I haven't been around the political process all these years. But when the American people speak up, those who are elected begin to listen. And so I decided I'm going to lend my voice to this discussion. I think it's an important discussion, and it's at the right time to do it. MARTIN: So I take it if you're on the board of this company, you're not just talking decriminalization but, rather, you're talking legalizing cannabis. Am I right about that? BOEHNER: At this point, 33 states have approved the use of cannabis in some form in their states, and the federal government frankly is standing in the way of legitimate businesses in these states trying to operate, you know? Banks won't take the money because, federally, it's, quote, "illegal." And so the federal government needs to move out of the way and allow these states to do what they've been doing now over the last five or six years. MARTIN: Do you favor medical use only, or do you also feel that recreational use should be permitted? BOEHNER: I don't - if somebody wants to use this recreationally, that's their business. But because it's a Schedule I narcotic, according the federal government, the only real research that's done really has been coming out of Israel. And as long as it stays a Schedule I narcotic, it's going to be very difficult to do the kind of research to back up the anecdotal digital evidence that we see and I hear about virtually every single day. MARTIN: You know, I'm wondering if you have any regrets about your past positions. The data suggests that black people and Latino people nationwide have been arrested and incarcerated for cannabis and other drug crimes at least four times the rate of white people. Now that states are decriminalizing marijuana, at least, for medical use - and as you pointed out it's, you know, two-thirds and, at this point, it's becoming big business - do you have any regrets about the fact that so many people have spent so much time in jail for something that you now don't think should be illegal? BOEHNER: Well, you know, almost all those people are incarcerated under state laws. Federal government made some movement late last year in terms of criminal justice reform, something that I've frankly been for for a long time. I just don't think we need to be crowding our jails with people who are not a threat to society. And using marijuana, in my view, is not a threat to society. BOEHNER: No, I don't have any regrets at all. I was opposed to the use of it. The whole criminal justice part of this - frankly, it never crossed my mind. MARTIN: And now that this is becoming not just decriminalized but legalized and a lot of large companies are getting involved in it, it does seem that many of the people who've paid a heavy price for something that you now think should not be legal are not being able to participate in part because they have criminal records or because they're afraid to be in it. I mean, do you think that something should be done about that? BOEHNER: Yeah, I do. I frankly think the states, especially those states who have approved the use of cannabis, ought to be looking at the criminal justice reform in those states. I think it's entirely appropriate. MARTIN: You know, there's another side of it. There have been a number of articles written about people who are concerned that not enough research has been done about the use, what dosage, all those kinds of things. There's one study in Colorado that suggests that, you know, heavy users account for most of the demand, and some people are concerned that legalization makes it easier for heavy users to abuse the drug. Do you have any concerns about that? BOEHNER: No. It's just like any other drug, any other vice. It can be used to excess and likely will. But that doesn't mean that we should take wine or liquor off the market or beer or cigarettes for that matter. And I do think that, by decriminalizing, you're going to open up a lot more research so we can learn more about the 4,000-year history of the use of this plant. MARTIN: So, finally - oh, thank you for joining us to talk about this. You know I'm going to ask you - you've been known to enjoy an adult beverage from time to time, so I hear. MARTIN: Have you ever sampled the product that your company makes? And what do you think of it? BOEHNER: No, I've never used the product. I really have no plans to use the product. But if other people use the product, who am I to say they shouldn't? MARTIN: That was the former speaker of the House, former Ohio Congressman John Boehner. Last year, he joined the board of directors of Acreage Holdings. That's a company that cultivates, processes and dispenses cannabis. He spoke to us from the South by Southwest festival in Austin, Texas. Mr. Speaker, Congressman, thank you so much for talking to us. BOEHNER: Hey, Michel, thanks. No, it was great. Transcript provided by NPR, Copyright NPR.